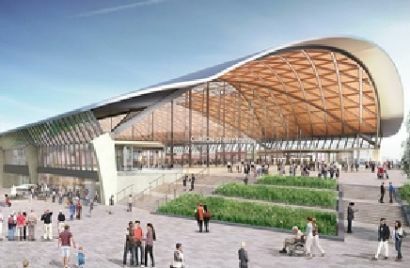 PLANNERS of HS2 are revealing a glimpse into the future today by publishing concept drawings of two stations in the West Midlands. The stations are to be built at Curzon Street, on the site of the first ever station in Birmingham, and at Birmingham Interchange, which will provide direct connections with the West Coast Main Line, the National Exhibition Centre and Birmingham Airport, as well as serving Solihull and the surrounding area. The images are going on show at Birmingham Central Library as part of a series of events about HS2 in the West Midlands this autumn. Developers are inviting opinions about their proposals. Curzon Street was replaced as a passenger station by the first Birmingham New Street in the 1850s, but the original building still stands. It will have seven platforms, and is scheduled to open in 2026, along with Phase 1 of HS2 between Birmingham and London. Local links will be provided by extensions of the city’s tram network as well as interchanges with existing railways at nearby Moor Street and New Street stations. The designs are not final. HS2 Ltd is also considering a number of extra elements put forward by the Urban Growth Company as ‘potential aids to growth’. Curzon Street is being designed by WSP UK Ltd amd Grimshaw Architects, while the contract for Interchange has been awarded to Arup. Work is now underway at 60 sites along the route. Transport secretary Chris Grayling visited Curzon Street last week with West Midlands Mayor Andy Street to mark the beginning of work. At the peak of the construction phase between London and Birmingham, 30,000 people will be employed.